In a medium skillet, cook bacon over moderate heat, stirring occasionally, until crisp. Remove to paper towels; reserve 1/4-cup drippings and set aside. Scrub potatoes and place in a large saucepan. Cover with water, add 1/2 teaspoon salt and bring to a boil. Lower heat and boil gently until tender when pierced with a fork, about 25 minutes, depending on their size. Drain and cut into 1/2-inch cubes. Place in a large bowl; add eggs, scallions, pickles, celery seed, pepper, garlic salt, mayonnaise and bacon. Toss gently until combined. At this point the mixture may be refrigerated, covered overnight. In a small saucepan heat reserved 1/4-cup bacon drippings, vinegar, hot water, sugar and mustard. Bring to a boil, whisking constantly, and boil for 2 minutes. Pour over salad; toss gently. Serve warm or at room temperature. 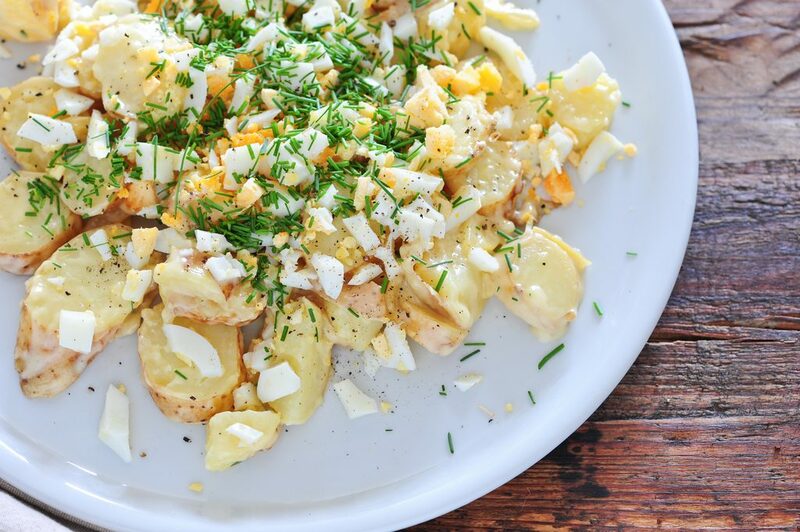 Garnish with eggs cut into slices or wedges, bacon, olives and parsley.